Galileo Galilei perfected the first device known as a microscope in 1609. His compound microscope had a concave and a convex lens. 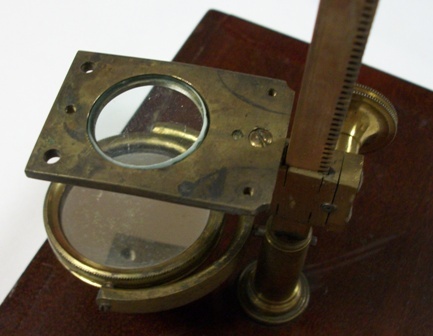 The first microscopes were monocular instruments with simple lenses and made of brass. The sample here is from 1840 which, some sources tell us, are the oldest an antique microscope collector may hope to find. It was designed by Charles Gould who worked for the nephews of William Cary, a very popular instrument maker, establishing himself as such in 1789. His nephews continued to run his business after his death in 1825 at 181 Strand, London. Henry Gould, son of Charles, eventually took over this business which continued until 1891-94. 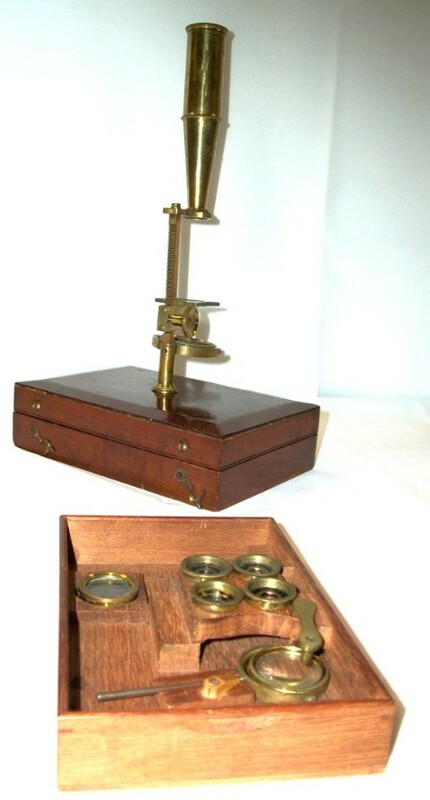 When this microscope was demonstrated it was shown that you insert the numerous lenses to create a greater magnification. Using the device with a single lens was also an option, thus the ‘Single and Compound’ name. The instrument is made from brass, the lenses were hand-made too. The box itself is made from mahogany. This model became very popular and well known and would have been utilised to examine everything from small insects to stone samples. Even the notes that came with it were handwritten in a beautiful sloping script.